We have now reached the end of our story only to find we have arrived at the very beginning of the next story. By the end of this week all nine of our ships have arrived in South Australian waters with the Buffalo arriving in Holdfast Bay on December 28th. As soon as the Buffalo arrives, a meeting is held in Robert Gouger’s tent where a Proclamation announcement is agreed upon. The settlers then assemble around a giant gum tree while George Stevenson reads out the proclamation and the Province of South Australia is officially proclaimed. This week we will look at the Proclamation of South Australia and consider what it means to the settlers and the Aboriginal people who were already living in South Australia. Christmas day also falls this week which gives us an opportunity to think about the way people have celebrated significant days and events since 1836.
Who was involved in drawing up the Proclamation for South Australia? What was the purpose of the Proclamation? What was it to be used for? What agreements are made in the Proclamation? What does it mean? What is the significance of Proclamation day? Consider a range of perspectives. How were decisions made about the establishment of the South Australian colony? What impact did these decisions have on Aboriginal people? How is Proclamation day commemorated now? How do the agreements written in the Proclamation compare to life in South Australia today? Use a range of calendars to research the special days and commemorative events that are observed by people from different cultures and countries. Make a timeline for a whole year including as many of these events as you can find. Investigate the meanings of the following terms: proclamation, province, majesty, colony, native population, British subjects and founders. Read through the journal entries this week. If you were able to interview the authors what questions would you like to ask them? Pose questions to guide your research about how other Australian colonies were established? Do other states have Proclamation agreements? If so, how do they compare to South Australia's? Read this week's journal entries for December 28th. Consider how each of the authors depicts the events of the day. Which journal entries do you think would be the most reliable? Give reasons for your opinion. Is there any contradictory information between the journal entries? Use this information to construct a recount of the day's events. Compile a list of factual information included in this week's journal entries and a list of quotes that show someone's opinion. Write and publish your own statement of proclamation. Imagine that you are in charge of establishing your own colony. What rules and values would you like all citizens to agree to. The stories that we've heard from our voyages over the past 45 weeks have provided us with many opportunities to develop and apply the historical concepts described in the Australian Curriculum: history. The activities below give some suggestions about how these concepts can be explored using this week's journal extracts. 1. Evidence: In history, evidence is the information obtained from sources that is valuable for a particular inquiry. Evidence can be used to help construct a historical narrative, to support a hypothesis or to prove or disprove a conclusion. Imagine you are a journalist working for a local newspaper. The newspaper is running a special feature about Proclamation Day in South Australia and wants you to write a report to reconstruct the events at Holdfast Bay on December 28th 1836. The only evidence you have is the diary entry written by Mary Thomas. Use this evidence to write and illustrate your newspaper report. Consider how you can write a fair and accurate article if this is the only evidence you can use. Aspects of the past that remained the same over certain periods of time are referred to as continuities. Continuity and change are evident in any given period of time and concepts such as progress and decline may be used to evaluate continuity and change. Use internet search engines to find images and photographs of Holdfast Bay and Glenelg at different times in history. Use these images to draw your own pictures of what the area may have looked like prior to 1836, on December 28th 1836 and today. Use these pictures to make a spot the difference game. Give reasons for the differences and similarities in each picture. This concept is used by historians to identify chains of events and developments over time, short term and long term. The nine ships of our story have now arrived and the colony of South Australia is beginning to develop. Use internet search engines to find images and information about businesses, buildings, events, environmental changes and other developments in South Australia from 1836 to current times. Make a paper chain using some of these images and facts to show how the concept of cause and effect applies to the development of the South Australian Colony. What changes and developments in South Australia were a direct result of the arrival of these settlers in 1836? A person's perspective is their point of view, the position from which they see and understand events going on around them. People in the past may have different points of view about a particular event, depending on their age, gender, social position and their beliefs and values. Read through the descriptions of the proclamation in 1836 in this week's post. Consider how the following people would have described the events of December 28th 1836. - any other perspectives you can think of. Design a who am I game by writing a quote for what you think each person would have said about the Proclamation ceremony. Can your partner match the quotes to the people who may have said them? Empathy is an understanding of the past from the point of view of a particular individual or group, including an appreciation of the circumstances they faced, and the motivations, values and attitudes behind their actions. Christmas day is very different for our settlers this year. Mary Thomas writes from Holdfast Bay about 'keeping up the old custom of Christmas as far as having a plum pudding for dinner, likewise a ham and parrot pie......' Meanwhile Woodforde reminisces about warming his knees by a rousing fire at Christmas time back in England and thinks about his family and friends back home. Design a Christmas card for Mary Thomas or Woodforde to send back home to England. Design the front of your card to show what Christmas day might ave looked like in South Australia in 1836.Write a letter inside to describe our Christmas was celebrated in Australia and make comparisons to English Christmases. Imagine you are one of these people. How would you be feeling on Christmas day and how would you choose to celebrate? Why do you think Mary Thomas chose to have hot Christmas pudding for lunch when the temperature was 100 degrees Fahrenheit? Significance is the importance that is assigned to particular aspects of the past, e.g. 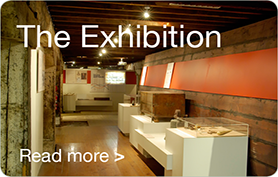 events, developments, movements and historical sites. Significance includes an examination of the principles behind the selection of what should be investigated and remembered and involves consideration of questions such as : How did people in the past view the significance of an event? How important were the consequences of an event? What was the duration of the event? How relevant is it to the contemporary world? December 28th is a public holiday in South Australia each year to commemorate Proclamation Day. This suggests that the proclamation of South Australia remains a very significant event for South Australians. Prepare a class debate about the topic:- Proclamation Day is no longer significant to South Australian people and should not be acknowledged with a public holiday. Conduct a survey of other students and family members in the school. Do they know why there is a public holiday in South Australia on December 28th? Do they think Proclamation Day was a significant event? What do they know about Proclamation day. Collect and discuss the results with your class. What are the common patterns ion these responses? Did anything surprise you? Contestability occurs when particular interpretations of the past are open for debate, for example, as a result of a lack of evidence or different perspectives. One hundred years after the Proclamation a reenactment of the Buffalo arriving in Holdfast Bay was held by local residents. View the reenactment and compare it to the accounts of the events we have read in this week's post? How accurate do you think the reenactment was? Are there any aspects of the reenactment that you think are contestable? Why do you think people in 1936 chose to commemorate Proclamation Day in this way? What do you think would happen if Colonel Light was the Governor of South Australia instead of Governor Hindmarsh?. 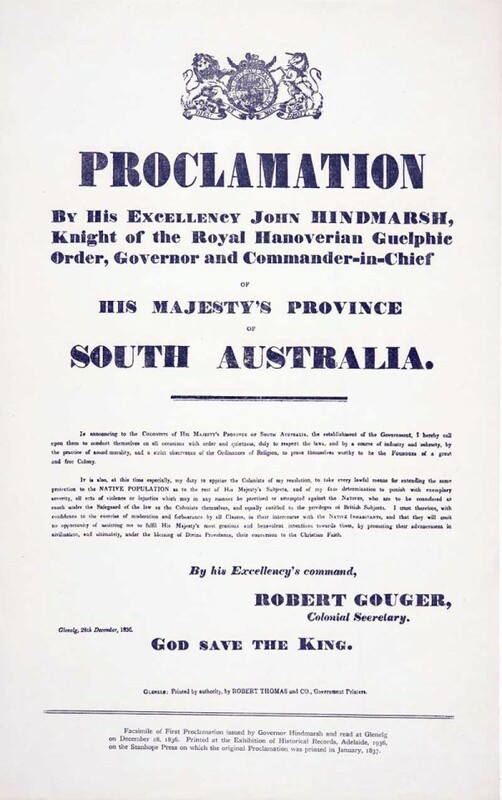 The Proclamation of South Australia on December 28th 1836 was a significant event for all South Australians. Thank you for joining us on the journey of a lifetime. Congratulations on staying onboard with us until all nine ships arrived in South Australia. 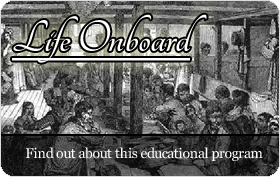 We hope you have enjoyed the voyages and done lots of historical thinking along the way.